Two inexpensive MacArthur Kindle books! Alone with God by John MacArthur ($0.99). We all know that spending time with God is essential to an intimate, growing relationship with Him. Yet many of us struggle to make prayer a consistent, dedicated part of our daily lives. Alone with God offers powerful encouragement for anyone longing for a deeper, richer time of prayer. Here John MacArthur turns to the perfect mentor on prayer, Jesus Christ, as he explores the profound insights found in the Lord’s Prayer. 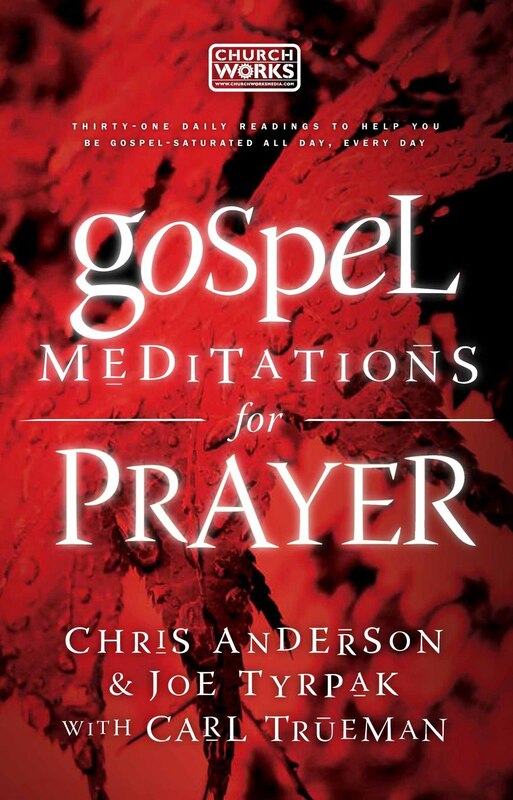 We’re very excited to announce the upcoming release of our latest devotional book, Gospel Meditations for Prayer. It includes 31 expositions of Scripture to inform and inspire Christians about the privilege of communing with God through the Lord Jesus Christ. Carl Trueman, one of the most insightful and articulate church historians and theologians of our time, has agreed to write with us. Carl is the Professor of Church History at Westminster Theological Seminary in Philadelphia, PA. He is a lover and defender of the gospel, and I’m certain that his contributions will be good for Christ’s church. We will be getting these for our congregation. I highly encourage others to check it out! Christian Audio is offering a biography on A.W. Tozer for free this month. Haven’t read it personally but several who have say it is worth getting–especially for free. You will be encouraged by some of this man’s godliness but also realize that he had feet of clay–like all servants of God do. Many bloggers I read are talking about the new book by J. D. Greear entitled Stop Asking Jesus into Your Heart: How to Know for Sure You are Saved. It’s on sale right now for a reasonable price in the Kindle edition. You can read one chapter here for free. “If you have ever heard the preaching of pastor Alistair Begg of Truth for Life Ministries, you know he has a Scottish brogue that seems to freshen every word he speaks. Now, Cruciform Press has teamed up with Alistair Begg to produce this beautiful, unabridged recording of what is quickly becoming a classic work from Jerry Bridges.This book is available as either a 2-CD product or downloadable audio book. It runs about 2.5 hours and lists for $12.98, but we are offering it here for just $7.49.” You can listen to chapter 3 of Who I Am for free by clicking here. David Murray reviews Building a Pure Life, a “book was forged in the battlefield of personal sanctification as Pastor and Biblical Counselor, Dave Coats, fought for purity in this muddy world. Also, having worked with people in this area of spiritual struggle for many years, he concluded that the best way to help people who already lacked personal discipline and self-control was to provide a workbook format that “forced” them to study the Word of God daily.Over an eight week period of manageable daily lessons, Dave systematically dismantles the heart idols that surround the sins of impurity and gradually builds a new and powerful sense of the greatness and goodness of God. The mind is renewed by daily readings, songs, meditations, and questions, hopefully renewing the heart in the process.” You can buy it here. How many of us have asked this question, whether openly or in secret? There’s something so disconcerting when we pray earnestly, confidently, possibly desperately, and yet it seems to go unanswered. God is silent. Or so it seems. Paul Tautges, in his new book, Brass Heavens , examines several reasons why our prayers may go unanswered. The result is a book that serves as much as a treatise on sin as it does on one of prayer. This is important for us to keep in mind as our sin does directly affect our prayer life—because Christians have a real, living, active relationship with our Father in Heaven, we can expect what we do to either strengthen or weaken that relationship. Keep reading for an overview and review of the book. Shepherd Press has just about all of their books on sale at $1.99. Here are some highlights: Broken-Down House by Paul Tripp; Nancy Ganz’s children’scommentary on Genesis and the other books of the Pentateuch; Dave Harvey’sWhen Sinners Say “I Do”; Christ Formed in You by Brian Hedges; Red Like Bloodby Bob Bevington & Joe Coffey; Get Outta My Face by Rick Horne; Don’t Make Me Count to Three by Ginger Plowman; Shepherding a Child’s Heart by Tedd Tripp (and the sequel); Everyday Talk by John Younts. Credit to Tim Challies for pointing out the above specials. Also Tim provides a list of ten of his favorite books for 2012 and several more which would receive honorable mention in his humble opinion! I have read a few of them and would agree. I’m hoping to read some more of his favorites in 2013.